Airbrush Makeup VS Regular Makeup ALL BRIDES MUST READ! Every type of makeup has it’s own pros and cons. Every makeup artist will have their own opinion on what they prefer to use on their brides. Ultimately, it all depends on your personal preference. If you can’t decide between the two, do a trial with both and see what you’re most comfortable with. If you’ve had your makeup trial OR your one of the already married gals, feel free to post pictures and let us know what you decided to go with and why. It’ll be fun to see plus it will provide some great makeup inspiration. A light-weight makeup applied through an air gun machine that produces a thin, even layer of makeup and creates a very matte finish. How it’s used: A small amount of a very thin makeup designed for air brush use is put into a chamber of a gun. When the machine is turned on and the gun trigger pulled, a light spray of makeup comes out of the gun in a fine mist. The fine mist of color covers the skin and gives the appearance of a flawless complexion. Your MUA will mix foundation colors for a perfect blend to match your skin tone. Since it’s such a fine mist your true skin tone shows through which makes it look more natural and not so much caked on. It will not transfer onto clothing, In professional photographs it looks amazing! Airbrush makeup is waterproof (bring on those tears!) and it won’t go anywhere until you wash it off. Be sure you don’t wipe away sweat/tears and instead ‘blot’. This will help guarantee your 16 hours of wear. A Liquid, cream, or pressed powder that is usually applied with a sponge, brush or finger tips. Traditional makeup comes in the widest variety of any other makeup, with every shade available. It’s also the most versatile of all the makeup; it can be as basic as a sheer tint of coverage, or combined with other properties to create a makeup that targets specific problems. How it’s used: This particular makeup is the only makeup that, given the appropriate formula is chosen, can be used in any situation at any given time. It can be applied many different ways, from brush methods used with thicker foundations, to finger tips used for light and well blended applications. This makeup is typically not waterproof, will rub off on clothing and will need the occasional touchups throughout the evening. If applied incorrectly you can get a sloppy cake-like finish. Any makeup with SPF will make your face white in pictures. Traditional makeup is known for being the most versatile. It can be used as a simple, basic sheer tint of coverage or used to target specific needs. I did my trial and she suggested i use regular make up since i dont have too many blemishes it looked nice but then again i dont use make up but it was perfect. I find that indeed the majority of makeup artists who prefer traditional over airbrush are in fact not comfortable using airbrush. It is possible to get a flawless finish using a brush, sponge, etc. but this takes experience & skill to perfect. I provide both but prefer airbrush because of the quickness and ease. Airbrush makeup can be used without an airbrush machine, but again not for the inexperienced. There are specific brands of traditional makeup that I like which are waterproof. Yaby Cosmetics makes exceptional foundations in creams, liquids and powders. These are all waterproof & designed by a makeup artist for makeup artists. Hi-Definition cameras have really made makeup artists more aware of their application methods. Every line from a brush or sponge, if not blended well, can be seen in detail through HD. Thanks for the info Stephanie! I'm glad you got something out of it Kimberly :o) I've been meaning to post this for a while now but kept forgetting to do it. It really helped me, all I kept hearing was airbrush was expensive but I think it is well worth the expense for flawless photos, not having to worry about bleeding makeup- retouches and most importantly getting make up on your dress. I do not want to worry about what my face looks like before taking photos. When I got traditional done for my epics that stuff didn't go anywhere! I'm sure she used a primer and then something to "set" it but HOLY cow that stuff took forever to get off. I had airbrush done this past Wednesday - LOVE IT!! It doesn't feel like anything is on your face (I hardly ever wear makeup) and it lasts a long time!! Trial was at 9:00AM and I still looked damn good at Midnight. I have friends who are MUA pros and I know they do both regularly, it seems like a preference thing. I definitely feel like the staying power has a lot to do with the application. I apply my own liquid makeup really lightly/quickly with my fingers and it wears off throughout the day. But last weekend I stopped at the Clinique counter and they applied the same foundation with a fan brush. I fell asleep with makeup on that night (bad I know) and when I woke up my foundation still looked perfect. I was actually kind of sad to wash it off. Kimi - I was half expecting to open this post and see pictures of gorillas with lipstick on or something. Your posts are funny. I can't wait to have my trial. 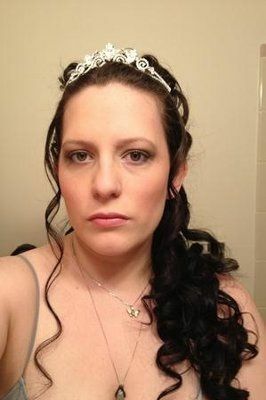 I was lucky enough to try out airbrushed makeup at a bridal expo recently. 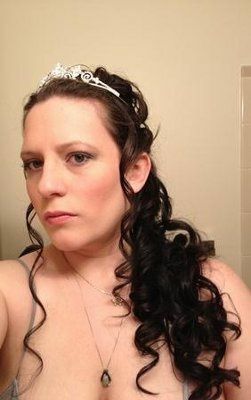 After trying it out, I'm certain I want to go with airbrushing on the day of the wedding. The MUA at the expo put false eyelashes on me, which looked good, but I think I will be getting eyelash extensions (where each synthetic lash is glued onto your original lash.. for a more natural look). This will have to be done days before the wedding, so it'll be hard not to get airbrushed makeup on it. Does anyone know if eyelash extensions and airbrushing can coexist? When she applied the airbrushing, my lashes were covered in makeup! Maile, can your MUA just blot the makeup off your lashes with a light non-greasy makeup remover? And then apply mascara as normal? Or can you not wear mascara with extensions? I would think the same would happen to natural brows and lashes, it's probably just more noticeable on the extensions b/c they're longer. @Malie, I'm curious why your lashes were covered in makeup! Sounds like she wasn't very careful. I was actually considering getting semi-perm. lashes done a few days before the wedding but I don't think I'll have time. My MUA recommends them since they pop a lot more and last a heck of a lot longer. They should be able to co-exist. Talk to your MUA and see what she says though. I'm having my makeup trial done in a few weeks and I think I'm def going for airbrush! I'll post before and after pictures when its done! @Maile S. - try those first before your wedding day. I had extensions put on before a vacation once and they were a NIGHTMARE for me. They didn't stay on as long as they were supposed to AND when they started coming off it was in pieces. It was an awful mess. I will never do extensions again!